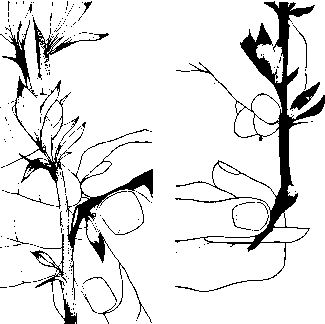 The taking of heel cuttings is a traditional way to propagate plants from stem cuttings. It is a widely used method of removing a stem utting from a plant, and it is quite possible to make heel cuttings of softwood, greenwood, semi-ripe, hardwood or evergreen stems. A young side-shoot is stripped away from its parent stem so that a heel, that is a thin sliver of bark and wood from the old stem, also comes away at the base of the cutting. The reason for taking a stem cutting with a heel is to give the cutting a firm base so that it is well protected against possible rots. It also exposes the swollen base of the current season's growth, which has a very high capacity to produce roots. Heel cuttings roots, for example those that are planted in autumn and have to survive through the winter before rooting, or those hardwood cuttings that are planted in a cold frame. Heel cuttings are also made from softwood and greenwood stems that are left to develop in partially controlled environments, such as a propagator. Heel cuttings can be taken at any time of year. Hold the bottom of the side-shoot between the thumb and forefinger and pull down sharply so it comes away with a long tail. 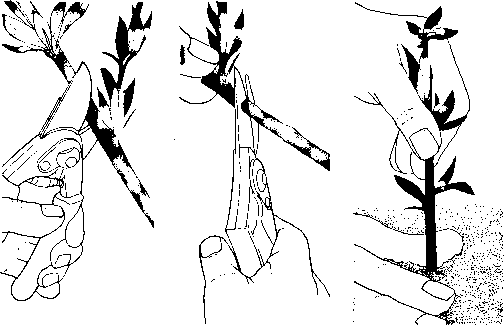 If the side-shoot does not pull off readily, place a knife blade in the angle close against the parent stem and cut away the side-shoot with a heel. Trim the tail on the heel and any leaves near it. Remove some of the tip on semi-ripe and hardwood cuttings. Dip the cutting in a rooting hormone. 1 Hold the bottom of a side-shoot between the thumb and forefinger. Pull down sharply. 2 Neaten the long tail on the heel and any leaves near it. Dip the basal cut in a rooting hormone. 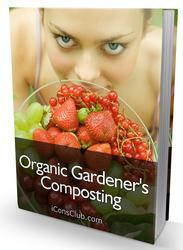 3 Make a hole in the soil or compost. Plant the cutting. Label it and water with a fungicide. Plant hardwood cuttings straight into the ground; semi-ripe and sub-shrub cuttings in a cold frame; and less hardy cuttings in the protected environment of a propagator. Label and water them in with a fungicide. Mallet cuttings have a hardwood plug at the base of each cutting to guard against rotting organisms. Their use is restricted to semi-ripe and hardwood cuttings, and they are especially successful for many Berberis when propagated in the autumn and planted in cold frames. Mallet cuttings are most successfully made from stems with a feathered habit, that is from a stem with small side-shoots. Prune back the parent plant in winter to encourage vigorous stem growth, which has a high capacity to produce roots. Take mallet cuttings from these new stems in the later part of the growing season. Cut horizontally with scissor-type secateurs across the parent stem immediately above a suitable side-shoot. It is important to make this top cut as close to the side-shoot as possible because the longer the snag the greater the likelihood of die-back and hence potential rotting. Make a further horizontal cut about fin below the top cut so that the side-shoot is isolated with a small "mallet" of parent stem. Split this piece of mallet with a knife if it is thick. Trim any leaves at the bottom. Dip the base of the mallet stem in a rooting hormone. Make a hole large enough to take all the mallet and part of the side-shoot with a dibber. Plant semi-ripe cuttings in a cold frame and hardwood cuttings in the open ground. Label and water with a fungicide. 1 Cut horizontally with secateurs across the parent stem just above a side-shoot. 3 Dip the basal cut in a rooting hormone. Plant the cutting and label it. Water with a fungicide. How to prepare a stem cuttings? How to grow plants from stem cuttings? How to make plants from cuttings? What is a heel cutting? How to plant stem cuttings? How to make a plant shoot at the bottom of the stem? How to stem cutting plants?